The Edie Carey show was a blast! It turned out to be a really different sort of concert from what we usually do. Usually we set everyone up in the living room and the artist sets up at one end, we have an amp, speakers (you know, plugged in), we record the show, everyone sits on chairs or sofas in rows. But for this show we decided to try something different. It was a pretty hot day, and while we have AC, we don’t have it pumping to the main floor (one of the downfalls of having a house built in 1897). 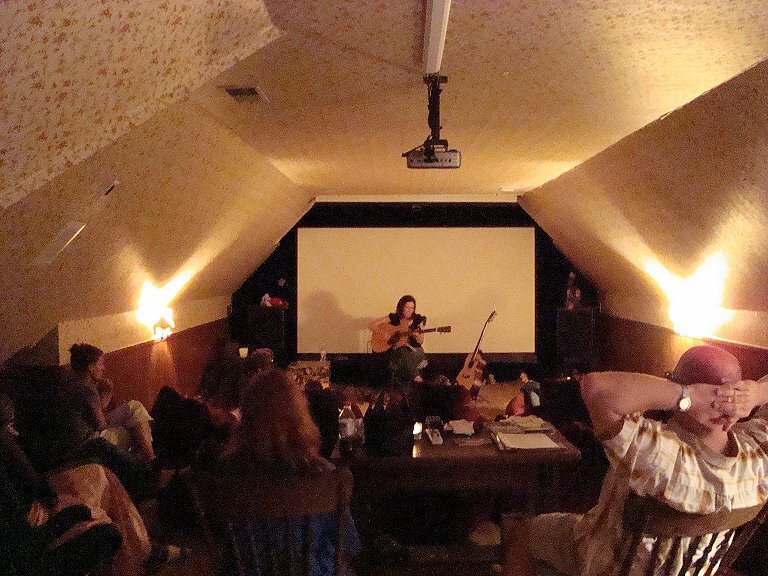 So we moved it all upstairs to the theater room where, just like a real theater, it’s very cool temperature-wise. We set Edie up in front of the movie screen and went completely acoustic, nothing plugged in at all. The guests all sat in our big comfy bean bag chaise lounge chairs on the floor. It felt very hippy dippy…in a good way! Edie put on a fantabulous show. It was very relaxed and intimate. 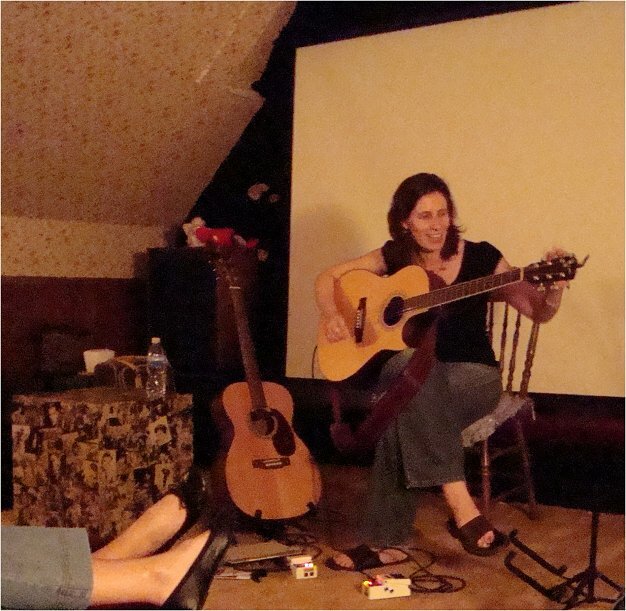 She told great stories, answered questions, and we even had a little bit of a sing-along.Brianna Lane was a guest and Edie asked her to sing on a couple of songs. It was just a really nice atmosphere. I kind of wish we could do all the shows this way. I took some photos, but I was trying to be unobtrusive so I did not use flash, and it’s pretty dark up there, so they are very grainy, but at least you can get a feel for the vibe of the night.